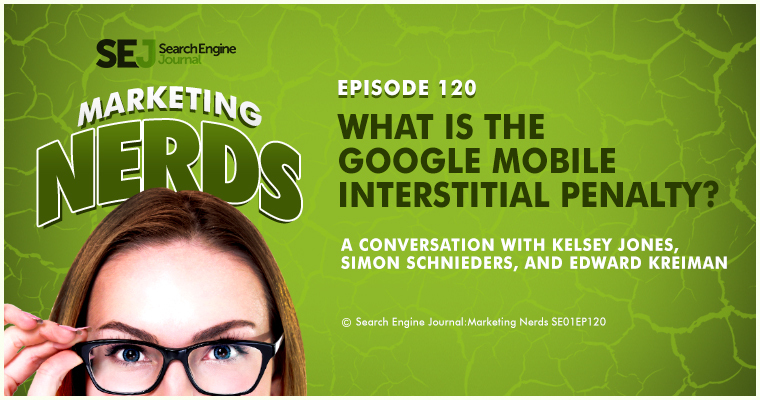 In this episode of Marketing Nerds, SEJ Executive Editor Kelsey Jones sat down with Simon Schnieders and Edward Kreiman from Blue Array to talk about what the upcoming Mobile Interstitial Penalty from Google is. 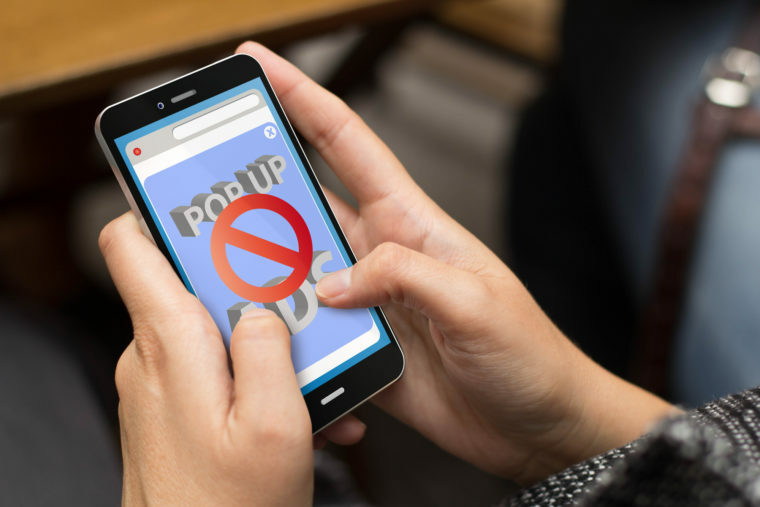 In an announcement made last August 2016, Google will start devaluing pages with intrusive pop-ups (also known as interstitials). The change will take effect on January 10, 2017. 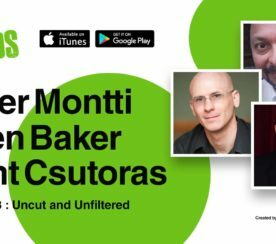 Kelsey, Simon, and Ed also discuss how to check to see if your site has been affected, how a mobile-first world has affected UX, and what Google is looking for in a positive searcher experience. 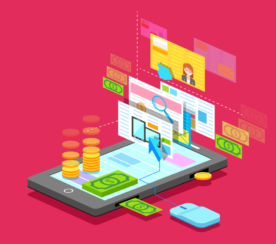 Can you give an overview of what the upcoming mobile interstitial penalty is? Simon: Sure. What we know about the interstitial penalty so far is that, first and foremost, it’s a mobile interstitial penalty. Then secondarily, it’s an intrusive interstitial penalty. There’s a size of interstitial that we’re aware Google frowns upon. We’re guessing it’s somewhere around 15% of the screen size. Anything beyond that would be into territory that could be penalized. We also know that Google won’t be releasing an interstitial penalty checking tool. The last we’ve heard is that they won’t be releasing anything. What counts as an interstitial and what is Google counting as an intrusive interstitial? Simon: Google’s being quite loose on exactly what they mean by an intrusive interstitial. They do have some examples on a blog post they did back in August 2016. It gives some examples of interstitials they say make content less accessible, i.e. they’re intrusive. They also give some examples of interstitials they wouldn’t have any problem with. 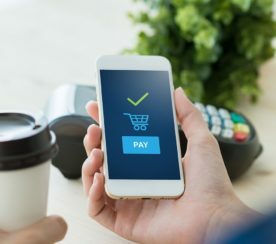 If it’s an interstitial that’s there for legal obligation such as age verification, cookie usage, or log in dialogues on sites where the content isn’t publicly indexable, meaning that it’s not as if you’re cloaking that content to Google, then they would be fine with those kinds of interstitials. Then they talk about banners taking up a reasonable amount of screen space. Again, ‘reasonable’ is up for debate. We would guess something around 15%. The tool that Ed’s been building around this is able to determine how many pixels that particular banner or interstitial would be taking up on the screen. We’re flagging around 15, or over 15%, as being a potential problem. Kelsey: That makes sense. I think when it comes down to it, Google is trying to make sure that any pop-ups you have, any ads, they’re not interfering with the user experience. That’s what they’re trying to avoid on a mobile screen. How has the rise of mobile usage affected the way you do SEO or the way you set up user experience on websites? Simon: Moving forward we’re going with mobile first. It’s a difficult habit for old guys like me who’ve been doing this for a long time. You need to think of accessing a website on a mobile device first and foremost. It’s not an easy trick for old dogs. Not just for mobile but also on desktop, we’re sort of thinking more about voice search now. Obviously, Google is gearing towards that with featured snippets, i.e. having very short, what could be audible answers to very common questions. We’re sort of thinking ahead towards voice search now but still obviously dealing with the very real now. The now is that it’s a mobile web. We still have some sites where they’ve got m. sub-domains with skinny content compared to the full-fat content on desktop. We were able to audit all of our client sites by going through with a crawl on 50,000 URLs by our mobile user agent versus 50,000 crawls with a desktop user agent and basically do a diff check. If we were seeing differences between the two, we were highlighting that to clients as something they needed to work on. I guess in terms of actionable steps that we took; that was one of the things we were doing. Kelsey: Yeah, that’s great. I think before, mobile versions of websites were an afterthought. Now, to hear developers and design agencies moving into, “We need to think of mobile first and desktop second,” that’s a huge shift in how we do design and user experience and SEO as a whole. How do you think AMP is factoring into the actions Google is taking with the interstitial penalty? Simon: Accelerated Mobile Pages I think is interesting. It’s something Google is certainly pushing hard on. You know that they’re changing the messaging that appears within AMP snippets from a lightning icon to something fairly obvious. As in this page will load a lot faster for you, something along those lines, to try to get users to understand what it is. If it’s user-led then obviously the publishers will follow. At the moment it’s something that has a fairly high opportunity cost. I find it a difficult thing to justify. One, because it’s a stripped down version of HTML, essentially. You got limited functionality with that. It’s fairly disempowering for publishers to take AMP on board. I guess the upside is you get some free organic visibility or increased organic visibility with AMP. At some stage maybe users will start to catch on that this is something that’s going to be faster for them but I don’t think it’s there yet. Is it worth that opportunity cost is the question right now. I’m not sure it is. Could it be something that Google will decide in a few months from now that they’re not seeing much user interaction with and will start to scale back that increased organic visibility? Possibly. We saw that with app indexing or deep-linking as well. They were giving free organic visibility to sites that had those deep links in place and that’s been stripped back. Could it be the same with that? Possibly. It was born because of ad blockers, right? It was Google’s answer to ad blocking. You’ve got to recognize that users are turned off by site speed and therefore, here’s our answer to site speed. It got rolled out very, very quickly. I just don’t think that it’s right for everyone. Can you talk more about your interstitial penalty checking tool, how it came about, and how it can be useful? Ed: Absolutely. Google published the upcoming penalty and we saw there is a need and opportunity for us to act upon. We developed a tool that’s using image recognition to identify potential interstitials on the page. Since we’re using image recognition, we can measure how much space it takes on the screen and therefore flag whether it’s a risk or not. The future thinking is we potentially might apply some machine learning to run on top of the images we’re capturing from the websites to automate and speed up the process of scanning and crawling. Simon: That’s interstitialpenaltycheck.com. Fairly memorable. Let’s say somebody uses your tool and they get flagged as, “Your interstitials could be taking up more than 15% of your site.” What are some ways they can change it and other ways to still get conversions without using those intrusive pop-ups or other aspects? Simon: I think if site owners have seen significant drop-offs in conversion by removing the interstitial, there is a work-around. If the user navigates to another page on the website, popping up an interstitial at that stage wouldn’t be a problem for Google. It’s the entry page that would be the issue for Google. Presuming the user has then decided that, “Actually, this is a great website and I’m going to explore a little bit more detail,” you can still shoehorn those interstitials in there if you’re absolutely resigned to that being the best way to convert users.